As you know, we’re really excited for DC’s Futures End: and the first wave of 3-D motion comics is here! Check out our video to see these lenticular motion comics in action, and be sure to order them at our DC Futures End series page. Plus! There’s still time to enter to win all 41 Futures End 3-D comics, plus all 52 Villains Month 3-D comics. 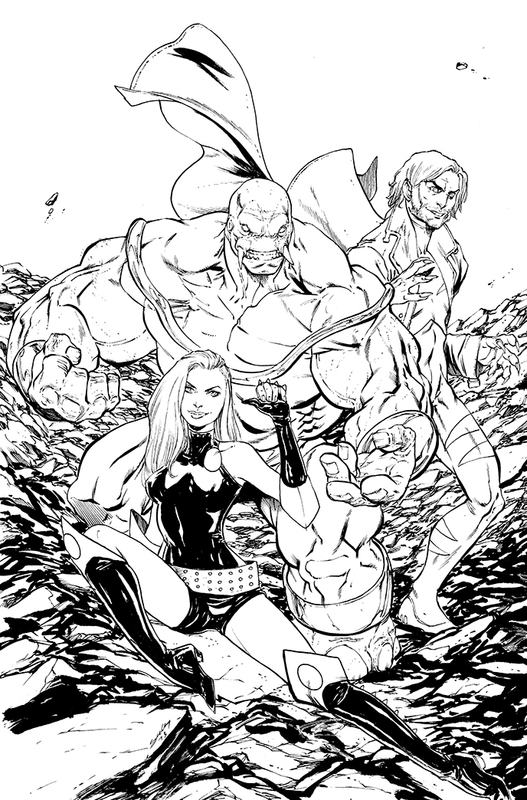 Get the details of our DC Futures End Contest now. We’ve made it simple to share this video on Facebook and other social media outlets with the social networking buttons near the title. If you wouldn’t mind doing us a solid and sharing this video with your friends, we’d be eternally grateful. Post your comments below! See All 41 DC Futures End 3-D Covers + Enter to Win! DC Comics is celebrating the third anniversary of the New 52 by giving fans a peek into the future of the DCU with Futures End — full of exciting twists and turns, and headed by fantastic creators like Scott Snyder, Greg Pak, Francis Manapul, and more! Head over to our DC Comics Futures End Contest page for full details and links to pre-order your issues and save 20%. 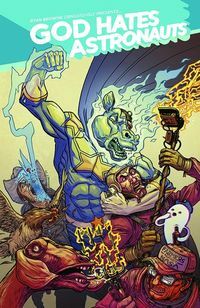 Ryan Browne’s God Hates Astronauts is almost impossible to describe: a gonzo superhero parody comic that’s visually arresting, hilariously funny, and wildly unpredictable — like Axe Cop for the 18+ crowd. When Browne launched a Kickstarter for his cult hit webcomic in 2013, he exceeded his $15,000 goal by more than 400%, raising $75,770 and publishing the first volume in a deluxe hardcover! Now he’s bringing back his bickering, battling superhero team — brought together by NASA to stop farmers from launching themselves into space — as a monthly series from Image Comics! We had the chance to interview him about what’s next for GHA and why you should pre-order the new series right now. Plus, Browne threw in a four-page preview for God Hates Astronauts #1 (NOTE: FOR MATURE READERS ONLY), which comes out September 3! TFAW: The first volume of God Hates Astronauts featured torrid affairs, bank-robbing owls, ghost cow heads, and lots of other fun stuff. What does the new series have in store for us? Ryan Browne: The new series is more plot driven and intergalactic in nature. I’m really trying to plan ahead and make this new volume epic in scope, while being as totally stupid and fun as ever. Finally all of the negligent, petty, over-reactionary antics of the Power Persons Five will come home to roost! Also, things will get punched a lot and there will be awfully obvious sound effects. TFAW: What changes have the Power Persons Five been through since we last saw them? RB: Well Star Grass and Starrior have a daughter named Starlina. Gnarled Winslow has hi-tech robo-arms, and Dr. Professor is starting to lose his mind. I wanted the new series to be a great jumping-on point for new readers, so the first issue starts with a new chapter in the characters’ lives. If you haven’t read the first volume that’s okay, but if you have you will understand more of the back history of the characters. TFAW: What made you decide to publish through Image as a monthly series, instead of doing another Kickstarter? RB: The Kickstarter was the best thing I’ve ever coordinated, but it was also the hardest. Months and months of running the Kickstarter and fulfilling packages as a full-time job meant that I drew a lot fewer comics last year than I wanted to. 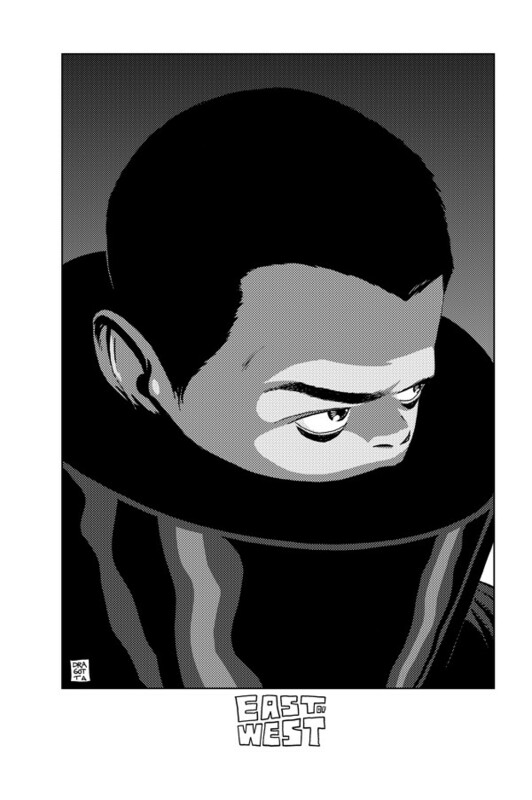 Using a publisher lets me focus more on the comic creation rather than the printing and distribution of the book. I love what Kickstarter provides for self-publishers, but after the experience I wanted to get out of self-publishing. TFAW: There’s really no other way to describe God Hates Astronauts than completely, flat-out, over-the-top insane. What are some of your influences? RB: Yeah that’s always been the problem of the book, how do you describe it? My biggest influences are the films of the Coen brothers as well as Die Hard, Robocop, and Aqua Teen Hunger Force. As far as comics go, I draw a lot from The Tick, Scud, and Milk and Cheese. I’ve always got to throw in there the first seven seasons of The Simpsons and the last few seasons of Mystery Science Theater 3000 as being really important for helping me develop my sense of humor. TFAW: Obviously, God Hates Astronauts fans will be all over the new series. But what are three reasons a new reader should pick it up? RB: Well, let me see. 1. It features astronaut farmers who ride horses into battle and use laser-shooting pitchforks against cosmic star bears. 2. It has more space crabs in it than any other book that does not have “crab” in its title. 3. The whole series is narrated by “3-D Cowboy,” a ghost cowboy that actually pops off the page in 3-D if you are wearing the proper glasses. Read the rest of our interview and see a four-page preview (NOTE: FOR MATURE READERS 18+ ONLY) after the jump! While Tim Seeley has been making more noise as a writer lately (Grayson, Revival), we’re psyched that he chose to showcase his formidable art skills by donating his Bloodliners cover to the Comic Book Legal Defense Fund. You can bid on this — and dozens of other pieces by Nick Pitarra, Emma Ríos, and more — at the CBLDF Live Art Auction at SDCC July 26. Since 2009, Things From Another World has been a proud supporter of the CBLDF’s SDCC auction, helping to raise more than $100,000 to help defend free speech for comic book fans, creators, retailers, and more. To see more of the incredible original art that will be available for auction at SDCC this year, visit our SDCC 2014 auction page now! Are you excited to see more CBLDF art? Will you attend this year’s auction? Post your comments below! 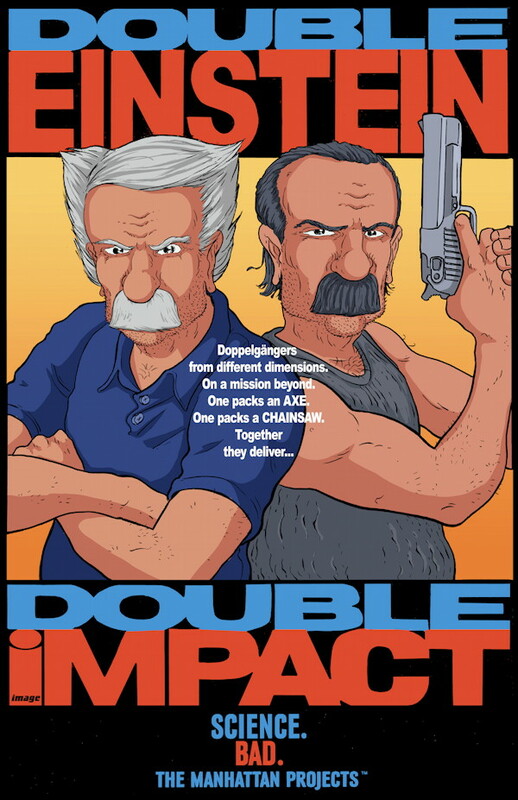 We were delighted to see the original artwork Nick Pitarra (The Manhattan Projects) donated to the Comic Book Legal Defense Fund: a Manhattan Projects cover spoofing the “classic” Jean-Claude Van Damme movie, Double Impact! Are you a fan of the “Muscles from Brussels? You can bid on this — and dozens of other pieces by Mike Norton, Fábio Moon, and more — at the CBLDF Live Art Auction at SDCC July 26. As a thank you to these fantastic artists, TFAW has created special limited-edition 11″ x 17″ prints on heavy, silk-finish cover stock: just 300 per piece (unfortunately, this does not include the original Double Impact poster — we know you’re disappointed)! Contact the artists directly to find out how you can get one. 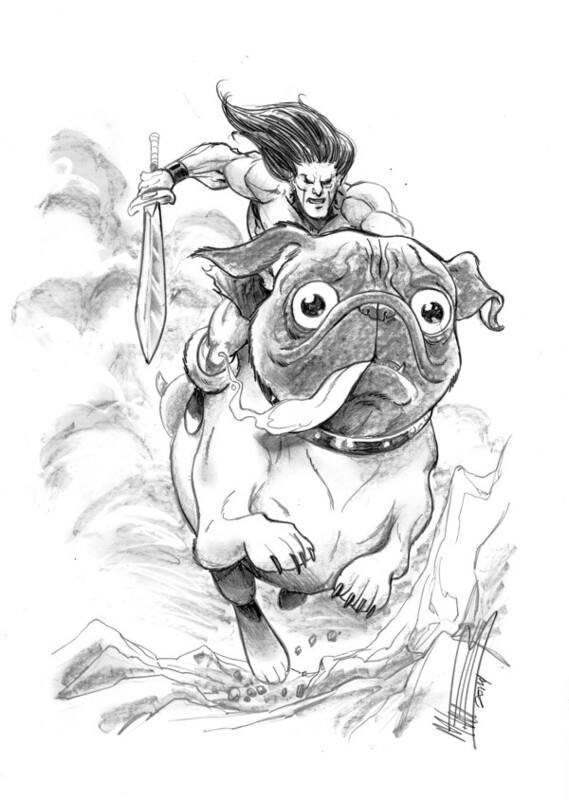 The amazing Mike Norton (Battlepug) has donated an incredible piece to Comic Book Legal Defense Fund this year: a thrilling shot of The Warrior astride his trusty steed, Battlepug! The best part? 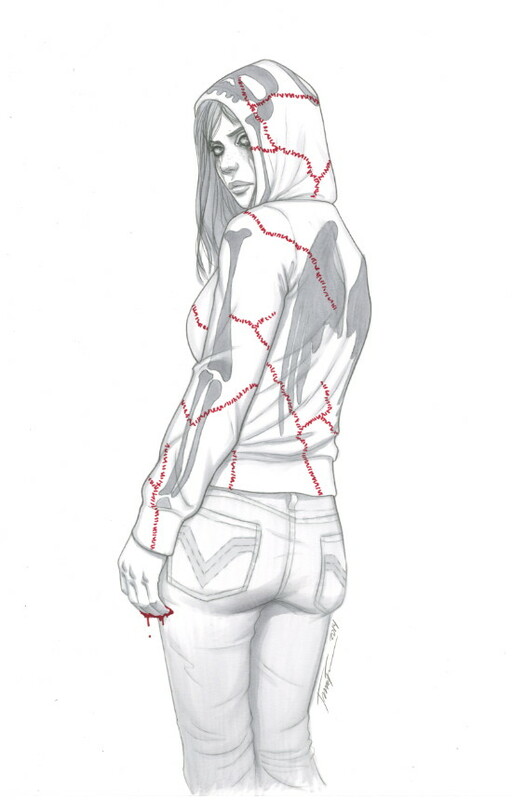 You can bid on this — and dozens of other pieces by Gabriel Bá, Jenny Frison, and more — at the CBLDF Live Art Auction at SDCC July 26. As a thank you to these fantastic artists, TFAW has created special limited-edition 11″ x 17″ prints on heavy, silk-finish cover stock: just 300 per piece! Contact the artists directly to find out how you can get one. 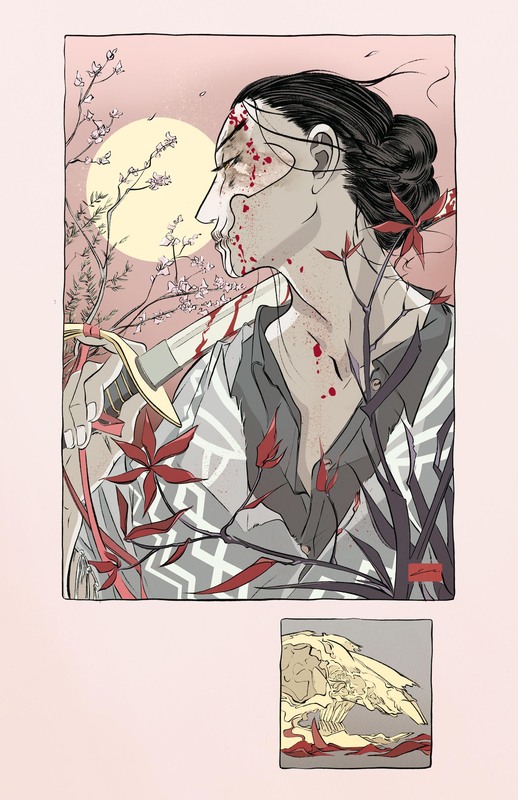 We’re delighted to share that artist Jenny Frison (Revival) has donated a one-of-a-kind piece of art to Comic Book Legal Defense Fund this year: a portrait of the iconic and mysterious Em! Bid on this — and dozens of other pieces by Frank Quitely, Emma Ríos, and more — at the CBLDF Live Art Auction at SDCC July 26. Going to San Diego Comic-Con this year? You’ve got two incredibly fun opportunities to support the Comic Book Legal Defense Fund this year — and we’ve got all the details! First, come support free speech and experience the best of Comic-Con at the CBLDF Comic-Con Welcome Party, Thursday, July 24, at the Westgate Hotel from 8:00 to 11:00 pm! This rooftop shindig is sponsored by Image Comics, Kickstarter, comiXology, and Eventbrite, with special gallery displays from TFAW and Black Phoenix Alchemy Lab. You’ll rub shoulders with some of the greatest creators in comics, including Brian K. Vaughan, Fiona Staples, Scott Snyder, Nick Dragotta, Nick Pitarra, Paul Pope, and many more. Plus, the first 200 attendees will receive a free gift bag, with exclusive items from Image Comics and CBLDF! RSVP now to guarantee your gift bag. This party is free for CBLDF members. Non-members: Suggested $10 to $20 donation at the door, please. Next, it’s finally here: the CBLDF Live Art Auction at SDCC! Saturday, July 26 from 7:30 pm to 9:00 pm, join the Comic Book Legal Defense Fund in Sapphire Ballroom EF at the Hilton San Diego Bayfront to bid on amazing original art from Jeff Smith (Bone), John Cassaday (Planetary), Emma Ríos (Pretty Deadly), Frank Quitely (Jupiter’s Legacy), Jenny Frison (Revival), Francesco Francavilla (Detective Comics), Jeff Lemire (Sweet Tooth), and many more! Since 2009, Things From Another World has proudly teamed up with CBLDF to solicit donations of original art for their annual auction at San Diego Comic-Con. We’re thankful that we’ve been able to help raise more than $100,000 to support the First Amendment rights of the comics community — be sure to preview some of these amazing pieces at our SDCC 2014 auction page now! Are you a member of the CBLDF? Will you attend this year’s auction? Post your comments below! The one and only Nick Dragotta (East of West) has donated an amazing piece of artwork to the Comic Book Legal Defense Fund this year: the cover to East of West #14! Want to own it? You can bid on this piece, and dozens of other amazing offerings, at the CBLDF’s San Diego auction this July. As a thank-you for his donation, TFAW is creating high-end 11″ x 17″ art prints on a silk-finish, heavy cover stock: a limited print run of just 300! If you’re interested in getting one of these prints, please contact the artist directly. 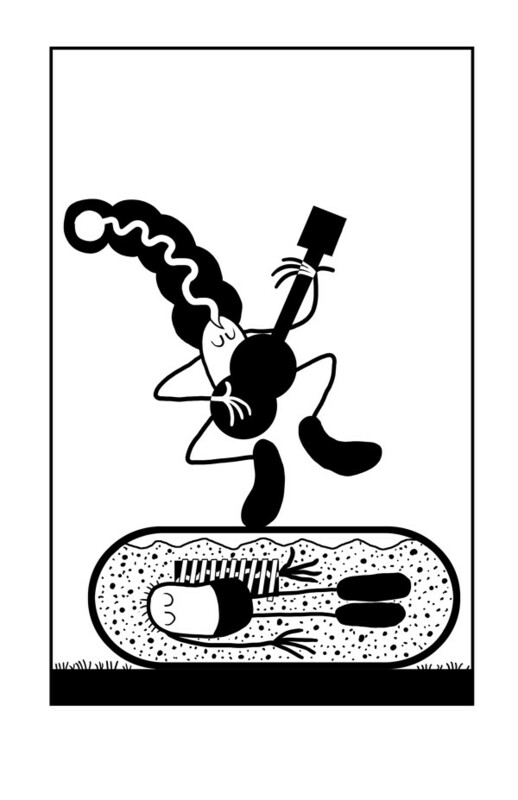 Artist Larry Marder (Beanworld) is contributing another amazing piece to this year’s Comic Book Legal Defense Fund for their annual auction in San Diego this month! Marder, who is the President of the CBLDF Board, has been a longtime supporter of the organizations efforts to protect free speech for the comics community. 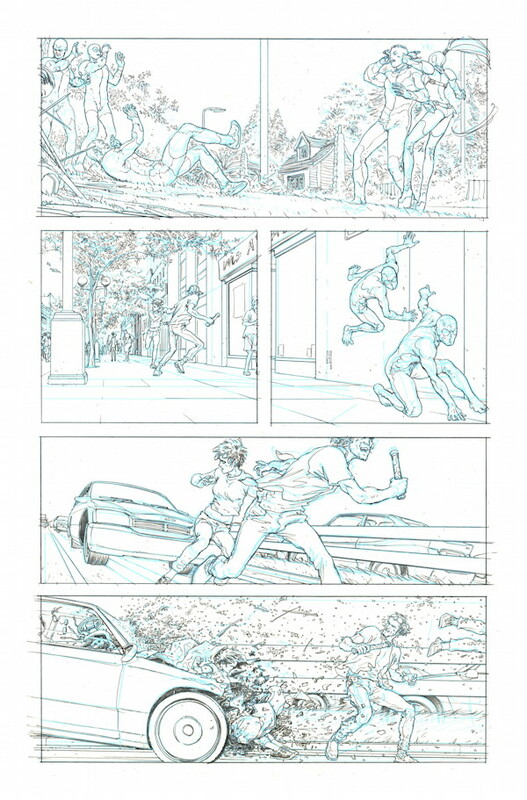 The legendary Frank Quitely (Jupiter’s Legacy, All-Star Superman) has been a big supporter of the Comic Book Legal Defense Fund — and their mission to protect freedom of speech — for years, and we’re excited to announce that he’s donated an original page of Jupiter’s Legacy to their 2014 auction at San Diego Comic-Con! We’re proud to announce that artist Emma Ríos (Pretty Deadly, Hexed) has donated a piece of original art to the Comic Book Legal Defense Fund, which will be available for purchase at the CBLDF’s San Diego auction this July. As a thank-you for her donation, TFAW is creating high-end 11″ x 17″ art prints on a silk-finish, heavy cover stock: a limited print run of just 300! If you’re interested in getting one of these prints, please contact the artist directly.